I’m completely smitten with our new X-Small Rhinestone Alphabet Letters! Bling doesn’t have to be big — just a little bling can make a big statement. With these X-Small Letters you can add a little bling to smaller canvases. I’m thinking lanyards, belts, bracelets, purse straps, wallets, makeup bags, dog collars, diaper bags, and socks — just to name a few! 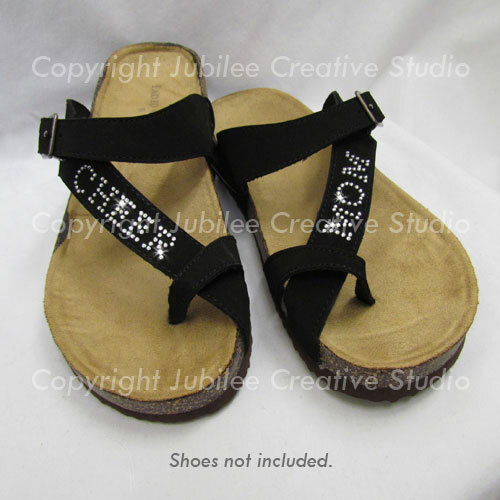 We added some X-Small Letters to these cute sandals to make Cheer Mom sandals. Each individual letter is about 1/2 inch high and 1/2 inch wide. Right now you can get 44 of these tiny letters (plus one exclamation mark!) for only $4.99. This sale price is good through September 12th. These little letters have big potential! Personalize any of our other rhinestone transfers by using these letters to add your name, initials, group name, or whatever you’d like! Where would you use them?